This cake could be made with any vegan white cake recipe but I have chosen to use my hot milk cake recipe because of the great response I got about it last week at the Toronto Vegetarian Association‘s Vegan Bake-off. I may not have won my category but I know it was well liked anyways. One of my favourite T.O. blogs She Does The City named my cupcake her favourite bake-off treat! Plus, I can make this cake in my sleep now so it was an easy choice. In a large bowl beat eggs made with egg replacer and sugar together. Heat the almond milk in a small saucepan and melt in the butter. Add the dry ingredients to the egg mixture in two batches, alternating with the hot milk. Mix gently. Make sure the batter isn’t too hot from the milk. Add in the rainbow sprinkles and stir in carefully so the colour doesn’t run. 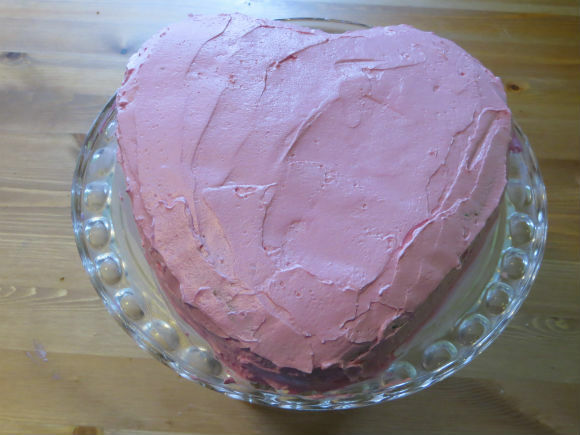 Pour the batter into an heart shaped cake pan and bake for 25-30 minutes. Add the vanilla and soy milk and beat for another 5 minutes until fluffy. Add in the red food colouring and mix until it is well combined. 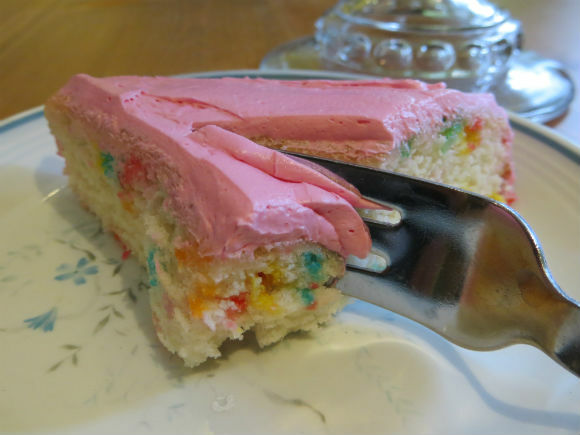 Add more if you want your icing to be a brighter pink colour. Remove the cooled cake and ice it! Serve a nice big slice to your Valentine. Don’t forget you can follow The Antique Appetite on Twitter @antiqueappetite, friend me on Facebook AND subscribe to the blog by clicking the link on the right! Also I have a new Pinterest page with links to some of my other favourite vegan recipes.